Infuriating. You put a ton of work into something, expected to knock people off their feet, and instead you get blank stares. Confusing. It’s obvious that the person giving the feedback doesn’t like something you did, but impossible to tell what that thing might be or how you might fix it. Fluffy. These are comments that feel nice, but don’t help you grow or get any better. Get in the gift-giving mindset. Know that warm, fuzzy feeling you get when you give someone a present and know they’re really going to like it or get a lot of use out of it? Think of giving feedback on a Club Member’s talk as a gift to someone you really want to help. This mindset will help you set the stage with generosity. 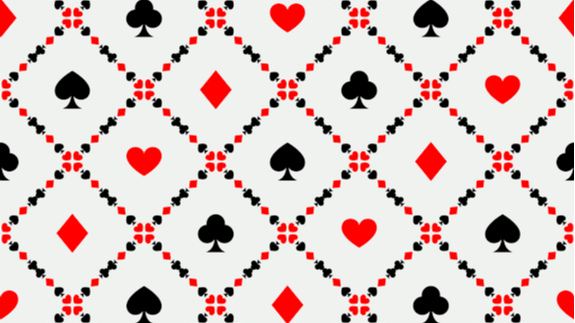 Try the Playing Card Method©. Know that deck of playing cards in your junk drawer? Well, it can teach you a whole new feedback language! 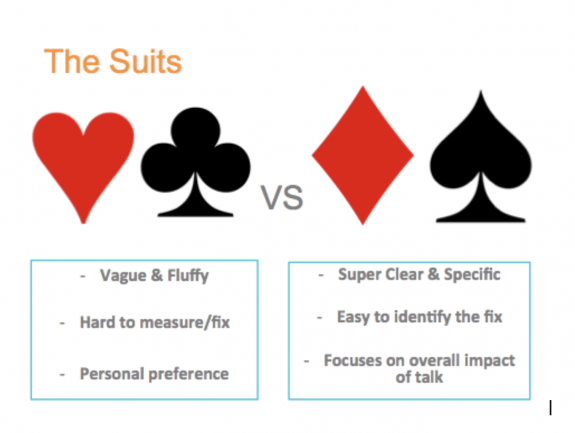 When you’re offering feedback, try to give diamonds and spades, rather than hearts and clubs. That kind of feedback will make it easiest for people to repeat the stuff that’s working and decrease the stuff that’s not! Author bio: Ashley Kolaya manages the TED-Ed Clubs program. The TED-Ed Clubs program supports students in discovering, exploring and presenting their big ideas in the form of short, TED-style talks. In TED-Ed Clubs, students work together to discuss and celebrate creative solutions to problems worth solving. Students also receive TED-Ed’s flexible public speaking curriculum to guide their club and to help inspire the next generation of leaders. To learn more about TED-Ed Clubs, go here: ed.ted.com/clubs. Happening upon this website has been a very informative experience for me a retired science teacher. I realize the value and abundance of the material you present on this website. As a result, I’ve been recommending your website to my family and many of my friends.